Hardscape refers to all the permanent, structural components of the landscape - paths, patios, arbors, walls, decks, and sheds - as opposed to the softscape, which is limited to plants, soils, and mulch. Installing a hardscape is a long term investment in the functionality and aesthetic appeal of your property. Based on price per square foot, hardscape is much more expensive to install than softscape, though maintenance is usually needed less often than with plants. Typically, the hardscape is designed first, which forms the structure that the softscape will fit into. There are two main approaches in landscape design - formal and naturalistic - which also form the jumping off point when considering the design of your hardscape. Formal design emphasizes straight lines and symmetrical shapes, while a naturalistic approach utilizes assemblies of asymmetrical shapes to achieve an overall design that appears balanced and orderly. 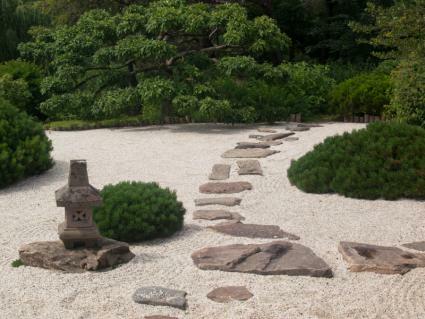 A kidney-shaped patio edged by the sweeping curve of a stone retaining wall that tapers off into the hillside exemplifies the naturalistic approach. 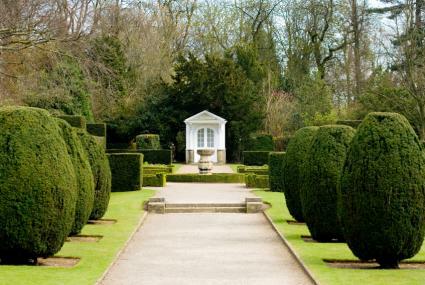 Formal hardscape design might include a series of rectangular raised beds constructed in two parallel lines with a central path between them leading to a circular fountain. A garden shed with weathered wood siding and a rustic wood-shingled roof has a very different style than a stucco-walled outbuilding. A flagstone patio with tiny ground covers creeping between the stones conveys something very different than a stamped concrete surface with brick edging. In other words, style has a lot to do with the materials used and the ambiance they create when combined in the landscape. The key is to choose what suits your personal sense of taste, what matches existing features (especially the house) and to use the choices consistently throughout the design. It's a good idea to start designing with an accurate base map of your property. Draw outlines of the hardscape features you desire and link them with a network of pathways. You will see very quickly whether a formal, symmetrical approach is a good fit for the shape of your house and property lines or if it would be an unnatural, forced approach. Consider the layout of paths carefully, as they are the arteries of the design. Try to keep it simple by routing them along the contours of the landscape as much as possible to avoid going up and down a lot and having to install stairways unnecessarily. When thinking about how to far to go with your hardscape project, it's wise to strike a good balance between the amount of hardscape and the amount of softscape. In an average size backyard, limiting the amount of hardscape to about one-third of the total space is a good rule of thumb to keep a good visual balance. Of course, if you have a tiny yard, you may want convert the entire space to a patio or deck, in which case the plantscape can consist of a container garden. 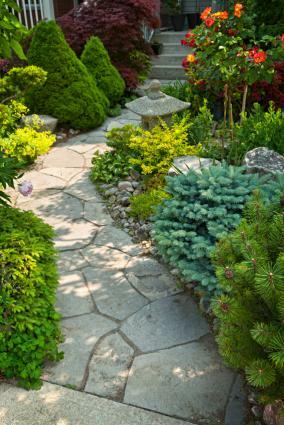 Consider the most common elements of hardscaping that you may want to include in your overall landscape design. As a ground level entertaining area, patios are considered an extension of the house and are usually adjacent to the back door. On larger properties, they can also be located away from the house as a destination for cookouts, parties or simply relaxing in the sun. Consider incorporating other hardscape elements with your patio to make it even more user-friendly - an overhead awning or pergola for shade, water feature or an outdoor fireplace, for example. Decks are by nature elevated off the ground, making them a logical alternative to a patio if the back door is not at ground level. They're also a great fit to hang over the edge of a slope to create flat, usable space on a hillside and to take advantage of a sweeping vista. Retaining walls are a way to stabilize slopes and make flat space for gardening or for a patio, deck or other form of hardscape. They serve an important function but they should be designed with aesthetics in mind - imagine the terraced hillsides of Tuscany or Indonesia for inspiration. 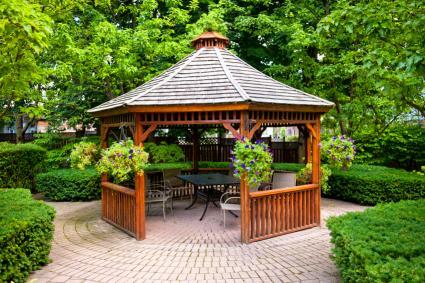 Sheds, gazebos, pergolas, arbors and trellises are other common hardscape elements to incorporate into your design. Pergolas and gazebos are enchanting backyard destinations, while arbors and trellises are designed to support the growth of vines, the former at entryway locations, the latter adjacent to a structure or the home itself. Often several of these hardscape elements are adjacent to each other or related in some way, so it's best to design them with a common visual motif, in terms of style, materials and color scheme. Each hardscape feature can be built with a wide range of materials, depending on the way it will be used, personal taste, and budget. Whether in the form of flat flagstones, decorative boulders, ornamental gravel or as a rustic retaining wall material, natural stone has a timeless - some would say priceless - presence in the landscape. One thing for sure is that it is pricey. 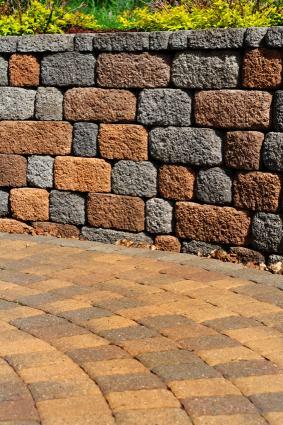 Using it strategically in small quantities - such as the concrete wall blocks with a thin stone facing that are commonly available - is one way to enjoy the look of stone without draining your hardscape budget. Concrete is generally the cheapest material to work with and offers an incredible degree of flexibility in terms of the form it can take. Wet concrete can be poured into forms for patios and walls, while concrete pavers and pre-fabricated blocks are an inexpensive alternative to their natural stone counterparts. Concrete can be dyed, stained, polished, textured and stamped with patterns to achieve any look desired - but alas, it is still concrete, which never quite looks or feels like natural stone. Wood has a lighter, less dominating feel in the landscape compared to stone or concrete, though its lifespan is somewhat limited. 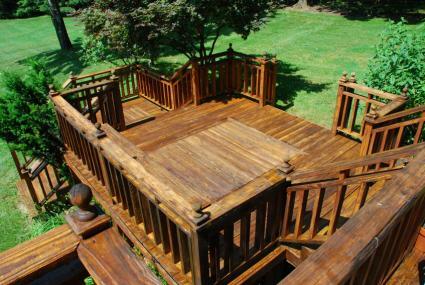 It is the only choice for decks, but can also be used for retaining walls - in the form of stacked railroad ties, for example. In general, wood is conducive to a landscape design featuring straight lines, while concrete and natural stone are easier to work with when curved lines and organic shapes are desired. Designing a successful hardscape is costly, complex and involved. Make sure you have all the information on the table before jumping in. Drainage is a major consideration in hardscape design that is often overlooked during the planning stages. Your property must be graded for water to flow away from all structures and hardscape elements and to move in a gentle, constructive way that does not result in erosion. Grading is often necessary to build hardscape features and is a costly part of the process that must be considered at the outset. Plus, most types of hardscape are impervious to rainfall, meaning the water that falls on them must be collected and routed to some sort of drainage system. 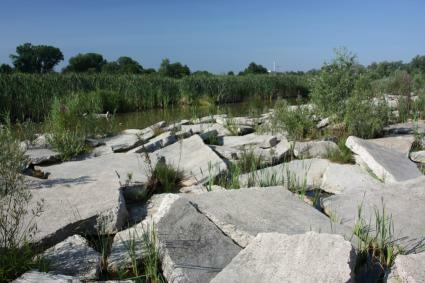 Concrete rubble is one of the world's biggest waste products - why not recycle it and incorporate it into your hardscape? 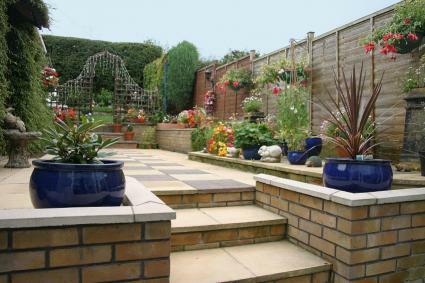 Flat, flagstone-size pieces of broken concrete can be used as a path or patio surface or stacked into retaining walls. Colored with concrete stain and planted around the edges, urbanite, as it's often called in the trade, is an inexpensive, Earth-friendly hardscaping material. Decks, patios, walls, drainage systems and other hardscape elements often require a permit from the local planning or building department. 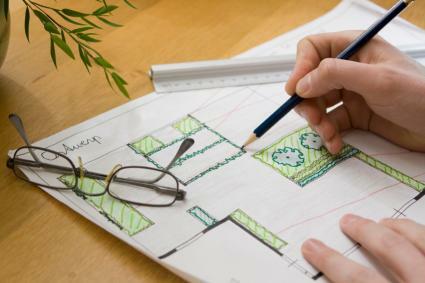 Depending on their complexity, plans from an engineer, landscape architect or contractor may be necessary. As load-bearing structural features, there is a safety element involved and it is better to hire a professional than assume liability if your good intentions result in unintended consequences. With all this information in mind, it is time to start dreaming and put pen to paper in planning out the hardscape components that will make a foundation for the landscape of your dreams.